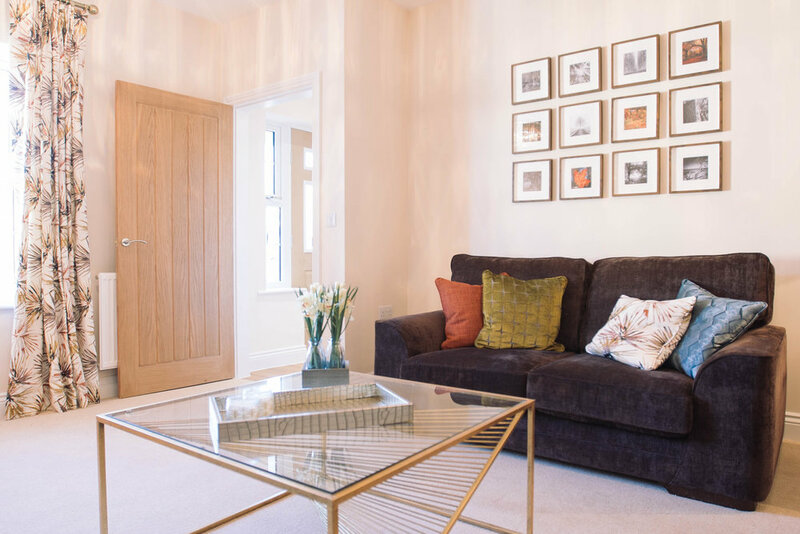 This year, we created the soft furnishings, window treatments and supplied the furniture for many show homes, including Llanfair Meadows, as part of Edenstone Homes. Our design featured warm colours and lots of light, with mostly plain or tartan fabrics. The brief insisted on a rustic feel, and so we incorporated lots of wooden tones and furniture throughout the house. Bursts of wooden hues were scattered in every room, including shades of yellows, deep blues and burnt oranges. The house is based in Aberthin, a small rural village in Wales. This influenced the undertones of an older country look that runs throughout the home. In the lounge, deep double pinch curtains (this style was used for all curtains in this project) made with Harlequin fabric were produced, and we supplied a coffee table from Coachhouse. This gold geometric-style table reflects the general wealthiness of the area. As well as this, a wooden sideboard from Made was supplied, plus matching lighting and accessories. This added to the rustic charm. In the kitchen, we made and installed Roman blinds using Harlequin ‘Cuphold Paprika’ as well as a pair of curtains that were hung on a brass pole. This was the same for the dining room as well, and in the breakfast area we supplied a coffee table and bar stools, again from Coachhouse. We ordered a corner sofa from Gallery, with five accompanying cushions. For the study, another Roman blind was created, this time in Harlequin ‘Walchia’. We supplied a rustic pine desk from Coachhouse and a matching chair, completed with an industrial shelf. This overall scheme for this room emphasised the old country design, and yet is still simple and light. The master bedroom consisted of a cleaner scheme. We installed two Roman blinds with Harlequin ‘Estrato’, and supplied furniture from Coachhouse and Gallery. The double headboard was fixed to the wall, and we purchased an interlined bed throw from Harlequin. Finally, we produced double pinch curtains in the kids’ bedroom, and a Venetian blind in the ensuite. As well as this, we also supplied the accessories throughout the household, such as artwork, mirrors and shelf items, some of which from our own showroom display.